Thai food is one of the genres of food I really love and that always feels like comfort food to me! It used to be my go-to before I started eating Paleo, and it’s our favorite date night when we decide to eat out these days. 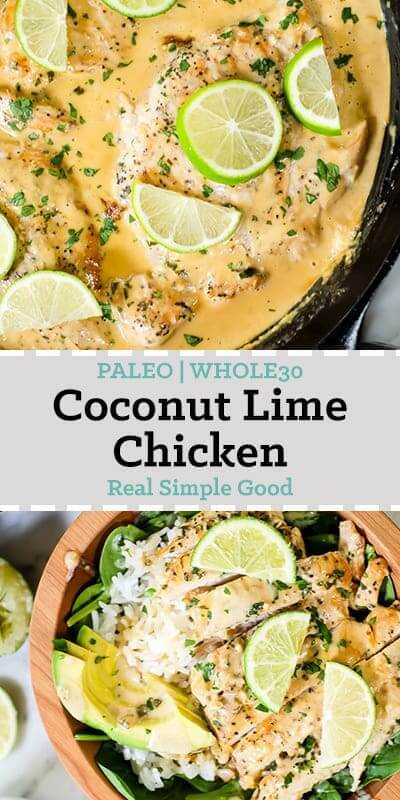 I have to admit though, this Paleo and Whole30 friendly coconut lime chicken really takes me back to a trip to Thailand several years ago. It’s so flavorful, fresh and satisfying! Many years ago I traveled to Thailand – it was the most spontaneous thing I’d ever done in my life. I purchased my airfare the week before I left and then packed up, hopped on a plane and met a couple of friends in Seoul, Korea where we boarded another plane to Bangkok. I’m not spontaneous or a risk-taker (at least I wasn’t then, but I’ll get into that more later). And then out of nowhere, this trip was the most soul-lifting experience, a much-needed rest and recovery, and it was also so much fun! 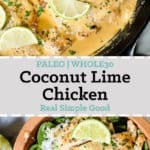 The first time we made this Paleo and Whole30 coconut lime chicken, I was taken right back to my time in Thailand. Isn’t it funny and cool how scents and tastes can transcend time and put you right back into a memory?! 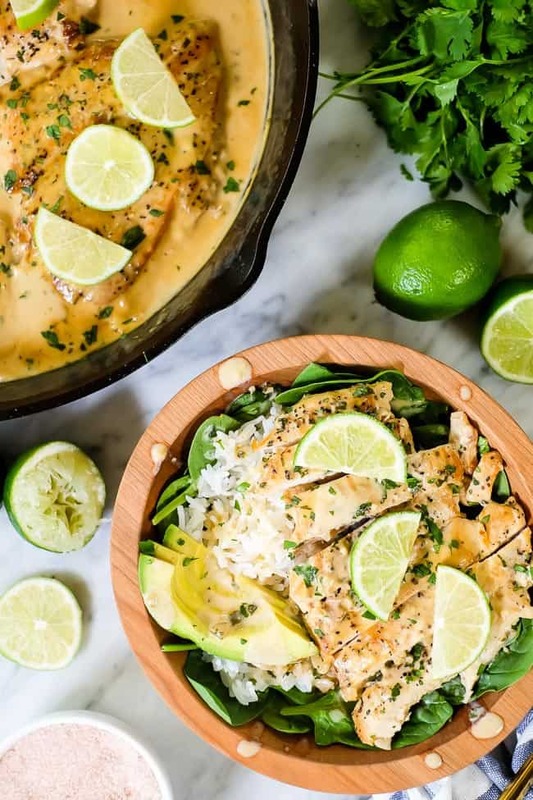 If you’ve ever been to Thailand or had authentic Thai food like Tom Kha soup, you will get what I’m talking about when you taste this coconut lime chicken. You’ll feel like you just sat down to table full of all the tasty family style dishes. I believe the food in Thailand can vary a bit depending where you are located in the country, but some of my favorite dishes came from the street food on the coast of Krabi – these women and their daughters would cook you up the most delicious meals right there at their little street carts, and it was so fresh and authentic. I had no idea until then that butter and egg yolks were naturally more of an orange color than the dull yellow many of us are accustomed to in the United States. But the flavors, the textures, the smells, all of it was so amazing. 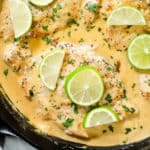 And every time we make this coconut lime chicken I am reminded of how fondly I look back on this trip. And it was not too long after my visit to Thailand that I started looking into my diet and lifestyle more. I came home feeling so happy, relaxed and nourished, and I really started to wonder why. I started to take a more honest look at my life and what I was doing, where and how I was spending my energy and what was and was not serving me. I didn’t figure it out quickly and really these were the just the beginnings of building blocks – and let’s be fully transparent here – I still don’t have it all figured out. But what I do know looking back is that I probably felt so good when I got home because so many of the daily stresses and worries were removed from my life for almost two full weeks. I ate real food in its most natural state, and spent time in nature. I had no idea that all these things have such a huge impact at the time, but slowly from this trip forward I started making changes. I gave up a more high-profile, super stressful job and moved to a less stressful and less time-consuming role. I began teaching barre classes more and spending more time mentoring others (a passion of mine). I can see now that all these pieces were starting to fall into place, little by little like building blocks. Like I said at the beginning of this post – I’m not super spontaneous or much of a risk taker (or at least I wasn’t and neither was Justin). I would say I’m still not overly spontaneous, but I’ve gotten more comfortable taking risks, and what I’m learning is that all the magic is there when you step outside of your comfort zone. Tip your toes in the water right outside your comfort zone. Just see how it feels. Does it excite you? Does it scare you? Does it make your soul shine? The answers are probably yes to all of the above. And for reals, Justin and I both decided to take the biggest risk of our lives to date just about two years ago – we quit our stressful, corporate jobs, sold our houses and moved to a smaller town. 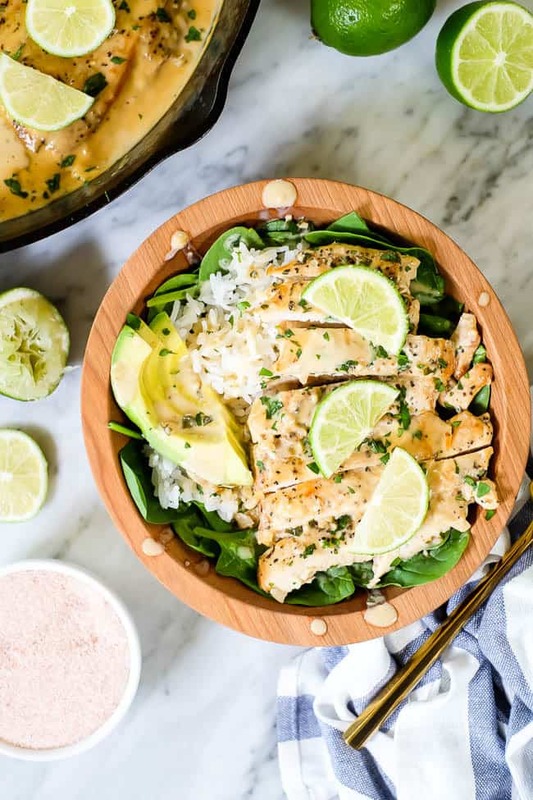 We set up shop in our in-home office and started working on this blog full-time, creating delicious yet easy and approachable Paleo and Whole30 recipes, like this coconut lime chicken. We decided for maybe the first time in our lives to follow our passion and our hearts. It was crazy! Our families thought we were insane! They thought we just needed a break from real life for a little while. But here’s the thing – we realized that “real life” is whatever you make it to be, and we decided we wanted to live life on our own terms. To create the kind of life we love waking up to every day, to help people and develop deeper, more meaningful connections with one another and others. 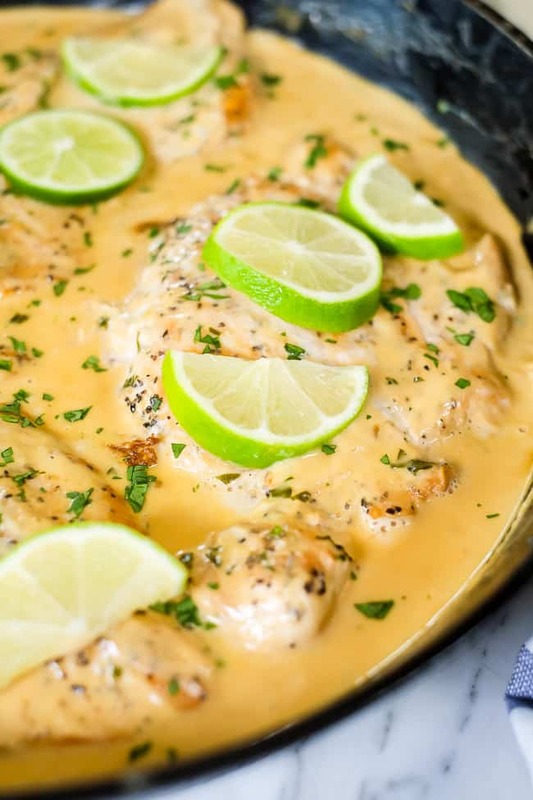 Quick, easy and full of flavor – you’ll love this coconut lime chicken! Make some, and then turn it into a bowl by adding some greens and rice or cauliflower rice. You know…bowls are life! Let us know it goes by leaving a comment below. Also, take a photo and tag us on Instagram @realsimplegood, so we can check it out! Already follow us on Instagram?! Great! If not, make sure to give us a follow, so we can stay connected! Add more oil if needed and add the garlic and shallot to the pan. Cook, stirring constantly, for 1-2 minutes. Serve with vegetables, potatoes, rice or cauli rice. Spoon some sauce over everything for serving. Sprinkle with cilantro and garnish with lime slices (optional). Made this for lunch yesterday. So. Good. 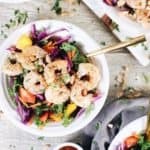 If you left a comment about substituting shrimp for chicken in this recipe, (the original comment was accidentally deleted) here is our response: You could use shrimp, but you wouldn’t need to cook the shrimp in the beginning like the chicken. So, you could skip all the way down and start at step #6. In step #8, add the shrimp in and it should cook in the sauce while simmering in 5-6 minutes. Just check it and cook longer if needed but the shrimp should cook quickly. Come back and let us know how it goes if you try it! Thanks! I tried it with shrimp and it was so good! 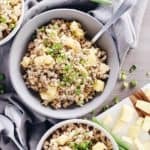 It paired perfectly with cauliflower rice! Yes, you could bake the chicken separately and start at step 6 with the skillet, adding the chicken back in at the end. Served with a cauliflower rice/red pepper/shredded carrot/cilantro lime zest side. Very tasty!!! Just made this for dinner, and it was incredibly tasty! I couldn’t resist adding a bit of fish sauce for some extra umami flavor (the red boat brand contains no sugar). Hi there! So excited to try this recipe…any chance we could use low fat coconut milk instead? Would it make it too watery? We prefer full fat because it makes it creamy and delicious and it’s full of healthy fats. We haven’t tried low fat coconut milk, so we can’t say how it turns out consistency wise, but you could definitely give it a try. Report back and let us know if you do! What is the brand of coconut milk you use? Can you take a picture of it? I made this tonight and it was delicious, but mine was a little watery and more of a white color sauce. What makes it that tint of orange? We use the brand Aroy D most often. It’s pretty creamy and full fat. Just the combination of cooking everything in one pan ends up in the sauce looking that color for us. Hope that helps! Hi, I’m allergic to cilantro, do you think I côuld substitute basil? Yes, basil would work just fine! We made this tonight and really enjoyed it. It had a very strong lime/acid flavor so I was wondering if anyone added something to cut the acidity? We’ll definitely make it again but will try to add something to calm it a little rather than just reducing the lime. You could try adding more oil to neutralize the acid a bit. I made this today but omitted the cilantro and shallot – I just didn’t have it in the house. I was still very happy with the results. Served with rice and veggies. This recipe looks amazing. I’m following the whole 30 diet. Was wondering if I could use my crock pot to cook this meal? We haven’t tried it so I’m not sure how it would turn out. I can’t recommend instructions for cooking it in the crockpot. 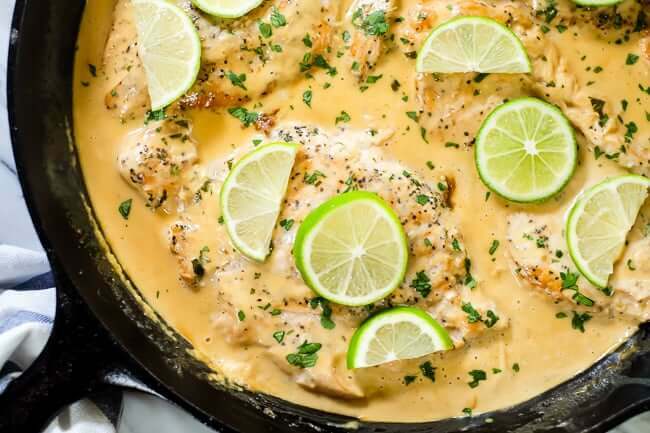 I made this and it was delicious, but the sauce was very watery, What did I do wrong or what could I add to thicken it up? Do you think this would go ok with Spaghetti squash? Hi there – the sauce might have separated because of the coconut milk you use. Coconut cream and milk tend to separate, we’ve found the brand Aroy-d full fat coconut milk to work best. Also, if you read the recipe it never says the sauce will thicken up, it just remains the consistency of full fat coconut milk. Sorry to hear that this didn’t work out for you. Everything tasted like lime. I would try just a table spoon next time. This was a hit in our house tonight! I love lime and cilantro, so the flavor was excellent IMO. I did allow the sauce to reduce down a bit & thicken before adding the chicken back & it came out with a nice consistency. I followed the recipe and used all the original ingredients and also added fresh ground coriander & a pinch of crushed red pepper flakes. We served it over seasoned basmati rice with a side of sautéed fresh veggies. Will definitely make this again & will also try it with shrimp. Thanks! Sounds excellent, glad you all enjoyed the recipe! Any idea how long this would take if I just put it all in the slow cooker? Thanks!! Depending on the size of the chicken breasts, you could try cooking for 3-4 hours on low. If you pound out the chicken as noted in the recipe you could cut the cooking time down to about 2 hours. Was amazing! We used chicken breast tenders. 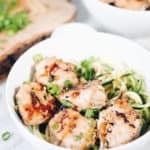 What would be a foot weight for chicken for this recipe? The weight would be around 1.5 to 2 lbs. Really disappointed on this one. Very little dimension. Maybe I’ll try it agian with basil and some fish sauce. Sorry to hear you were disappointed. We hope you have better luck next time with your modifications. I’m beginning to think that people think we doctored the photos for this post :). It’s really what the sauce looked like it when we made it. The sauce will turn out thin if you use a watered down coconut milk that is not 100% full fat coconut milk – we use Aroy-d brand. If you watch the video for the recipe you can see what it looks like with canned coconut milk vs. the full fat brand we used for the photos. I did not make this yet but I feel like from listening to your amazing story it will be delicious. I wanted to say that i hardly ever read the blogs that go with the recipes but i really enjoyed yours! Thanks for sharing your experiences, it’s very inspriring! maybe reduce the lemon juice, 1/3 cup of lime is it’s a little too much. I followed the exact recipe and the dish was way too sour. Feel free to adjust it next time. We like lots of lime flavor! This was really good! I was worried about it being watery but it was a perfect consistency, especially if you’re using the sauce to pour over rice and veggies. I did add some coconut aminos and a little fish sauce because it needed salt. 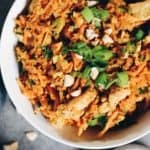 I had it with leftover grilled veggies and cauli rice and the hubs and kid had it with white rice, we all loved it. Siracha made it even better 🙂 Thank you! My husband and 5 kids thought it was delicious as is. But to anyone who doesn’t want to worry about your coconut milk seperating, just refrigerate it overnight. It will automatically separate the cream from the water. Use the cream only and your good to go. That’s also how we make our paleo sour cream. Absolutely loved this! Just got done eating and had to leave a review. The sauce is so so so good. Said good-bye to portion control just to have more sauce. I didn’t make any substitutions. Even my picky husband loved it. Thank you for this amazing recipe! You’re welcome! Thanks for the kind review :). I just made this for my family last night and everyone loved it! 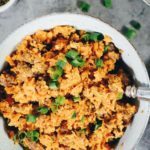 We served it over cauliflower rice and I personally liked the sauce being runny so I could spoon it over the cauli-rice and let it soak up. It is very strong lime flavor – which is amazing! 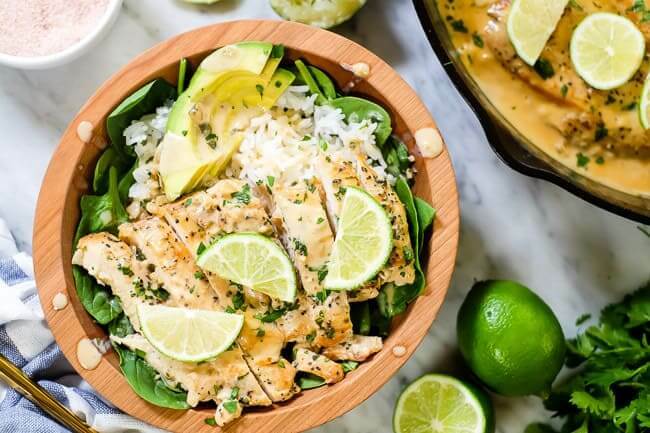 Lime and more lime please! 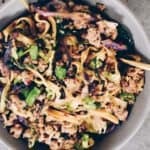 I just printed the recipe to add to our rotation of meals and shared the link to it on our neighborhood recipe swap so more people can enjoy. As mentioned above, my sauce ended up being lighter in color as well, but I didn’t use a cast iron pan and I used a different brand of coconut milk because it’s what I had on hand. Sounds great, happy to hear the recipe will be on rotation in your kitchen.